A near-silent allegorical fable of man vs. nature that stunningly explores the medium’s potential. 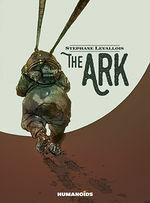 A lone figure in a diving suit drags an enormous wooden ark through the desert, scarring the earth with its deep furrow. A plane crashes. A zeppelin prowls the azure skies, its crew seduced by caged women, while Bedouins and soldiers clash under the blazing sun. This poetic tale entrances as it pulls all these elements and characters together into a haunting yet mesmerizing canvas. It’s just an incredible bit of storytelling and world building. What’s even more incredible is that it’s in all black and white and yet so incredibly detailed. This is an incredibly meaningful and symbolic allegorical fable. You’ll soak in the imagery and fall into it like a warm bath. Recommended for those willing to go on a thought provoking journey. 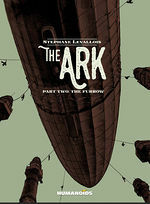 The Ark is a book to return to, to study scene by scene its layout and perspective choices and both its visual beauty and efficient use of comics visual language. Levallois challenges the reader to decipher this message within the framework that each brings to the work, though guided by its central, mysterious philosophy.